The Sea King MK.48 is a medium-size helicopter which has been build in licence by the Brittish company Westland. On 8 November 1976 the 5 Sea Kings were flown to Koksijde to take over the SAR-duty of the HSS-1 on the 1st April 1977. Because of heavy rescue conditions, the 40th Squadron receives an excellent reputation both in the Belgium and foreign countries. In 1997 the first season of the popular series 'Windkracht 10' was shown on the National television. As it was such a success, they made a second series which was shown in 1998. From then on the squadron was very well known in Belgium and The Netherlands. In 2006 the movie of Windkracht 10 was released and was a huge success as well. 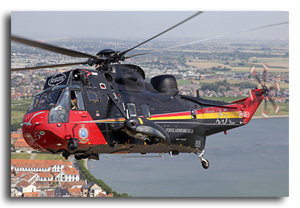 On Wednesday 4 July 2001, Sea King RS05 was revealed in a special decoration for the first time to celibrate the 25th anniversary of Sea King in the Belgian Air Force. It still wears this nice coloursheme today! On 17 December 2008 the first Sea King (RS01) was retired from service and was flown over to Brussels Air Museum. 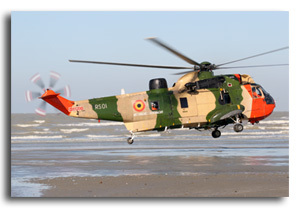 On 30 August 2013 a second Sea King (RS03) made its last flight and it put into storage at Koksijde to serve as spare airframe. The remaining Sea Kings will be replaced by 4 NH-90NFH helicopters which arrive in 2014.